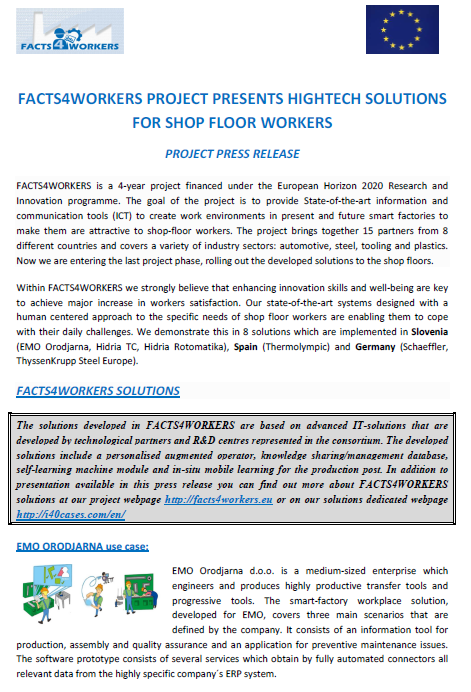 Download the free FACTS4WORKERS PRESS RELEASE which presents the project progress and solutions. The FACTS4WORKERS 4-year project brings together 15 partners from 8 different countries and covers a variety of industry sectors: automotive, steel, tooling and plastics. Now we are entering the last project phase, rolling – out the developed solutions to the designated use-case shop-floor environments. The FACTS4WORKERS project consortium strongly believes that enhancing innovation skills and well-being are key to achieve major increase in workers satisfaction. Our state-of-the-art systems designed with a human-cantered approach to the specific needs of shop-floor workers are enabling them to cope with their daily challenges.